I think the true essence of a city lies in its Street Food. 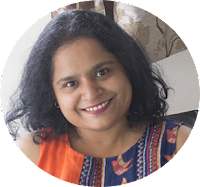 You get local food, fusion food and some even carry international favorites. But one thing is a constant in every food street, there is so much variety. After all, variety is the spice of life, isn't it? I've found these are one of the busiest places in a city, especially after sundown. We have our own little food street in Bangalore which is packed even on weeknights. Every city has its favorite, and so does Mumbai. Mumbai is famous for its Vada Pav and its Pav Bhaji. Lurking in their shadows is the Tawa Pulao. 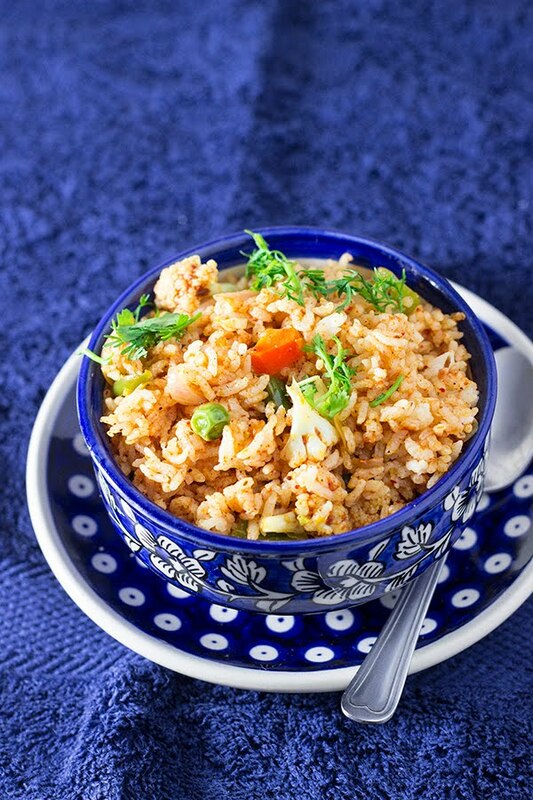 Tawa Pulao literally is rice and vegetables cooked on a flat griddle along with some spices and oodles of butter. Everything tastes better with BUTTER!!! Spoon in as much butter as you desire, it only improves the taste. 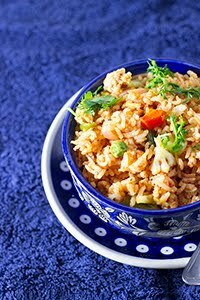 Tawa Pulao can be easily made VEGAN by skipping on the butter, or adding some yummy Almond Butter. 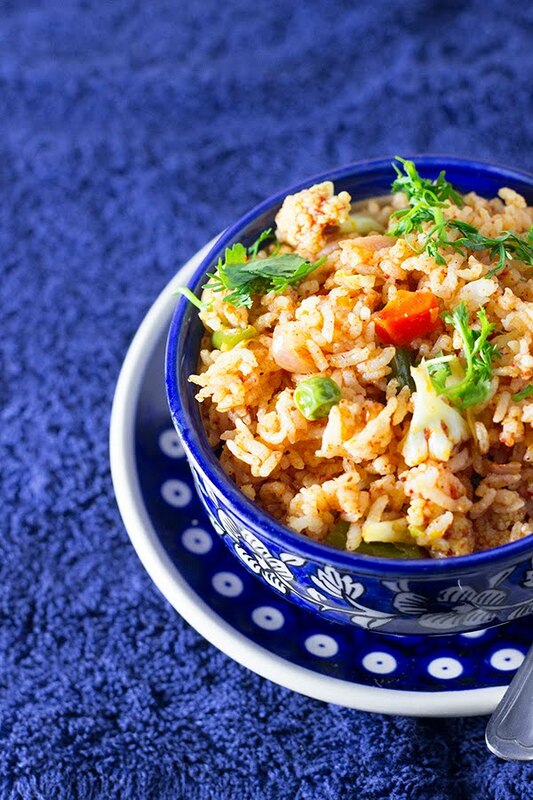 Tawa Pulao has now started to become a popular dish outside of Mumbai too. I've eaten it in so many places in Bangalore. It seems to be entering restaurants too. But the street version beats the restaurant version any day. On my list of favorite street food, Tawa Pulao ranks 3rd, right behind the Pani Puri and the Pav Bhaji. I must credit this recipe to my friend at work. She got this for lunch one day and I simply had to have the recipe. I was pleasantly surprised when she told me the recipe. I couldn't believe it was so easy to make. My friend makes it with only green peas and she adds a chilli paste as well. I add any vegetables I find in my fridge. In the past I've added babycorn, sweet corn, zucchini, mushrooms, broccoli etc. I guess you get the picture. 1) If using uncooked rice, wash the rice and cook it in 2 cups of water until it is done but not mushy. Allow the rice to cool and then gently fork it. 2) Dice the vegetables and keep aside. 3) Puree the tomato in a blender. 4) Heat the oil in a pan and add the cumin seeds. 5) Once they brown, add the onions and cabbage and fry until the onions are translucent. 6) Add all the remaining vegetables and 1/2 tsp of salt and cook until the vegetables are done but still have a bite to them. You can cover the pan to quicken the cooking. 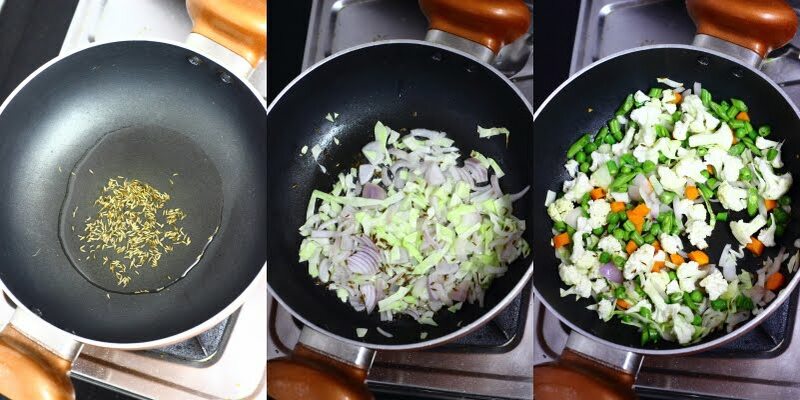 7) Remove the vegetables into a bowl, and place the pan back on heat. Add the ginger-garlic paste and the tomato puree and cook on low heat for 5-7 mins until the water from the puree evaporates and you get a thick tomato masala. 8) Add the pav bhaji masala and salt and mix well. 9) Add the fried vegetables and mix well. 10) Add the butter and mix well. 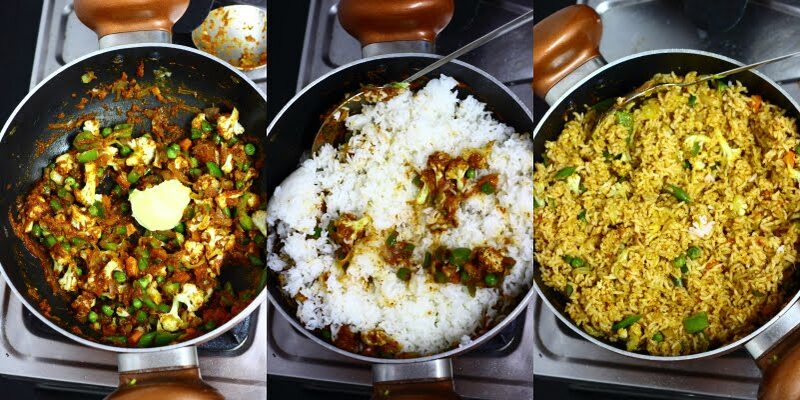 11) Add the rice and mix well. 12) Garnish with finely chopped coriander and serve. 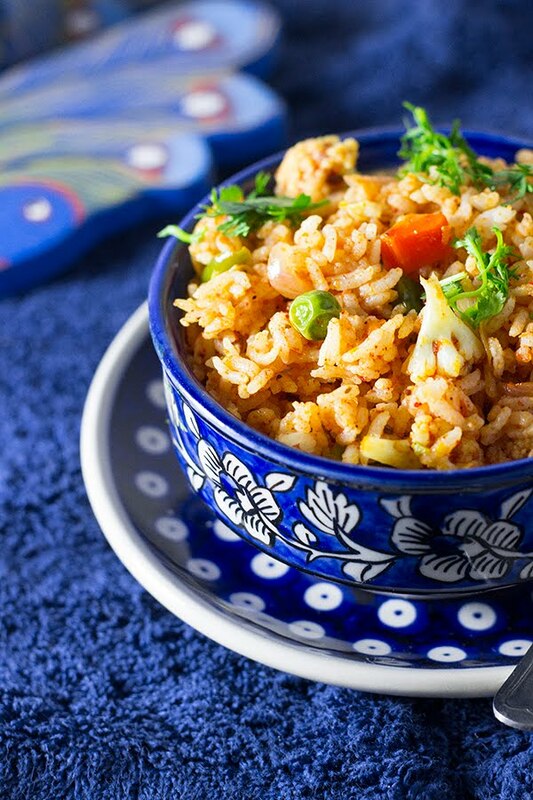 Tawa Pulao is rice cooked with tomatoes, vegetables and Pav bhaji masala. If using uncooked rice, wash the rice and cook it in 2 cups of water until it is done but not mushy. Allow the rice to cool and then gently fork it. Dice the vegetables and keep aside. Puree the tomato in a blender. Heat the oil in a pan and add the cumin seeds. Once they brown, add the onions and cabbage and fry until the onions are translucent. Add all the remaining vegetables and 1/2 tsp of salt and cook until the vegetables are done but still have a bite to them. You can cover the pan to quicken the cooking. 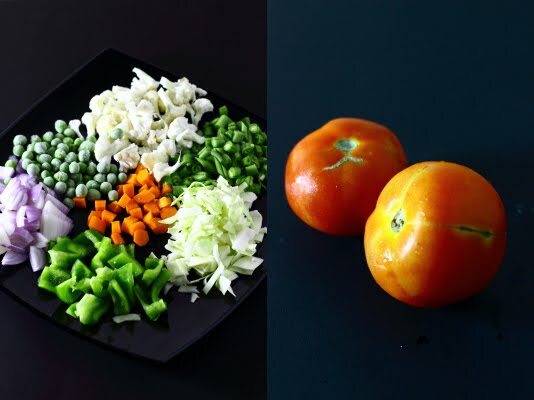 Remove the vegetables into a bowl, and place the pan back on heat. 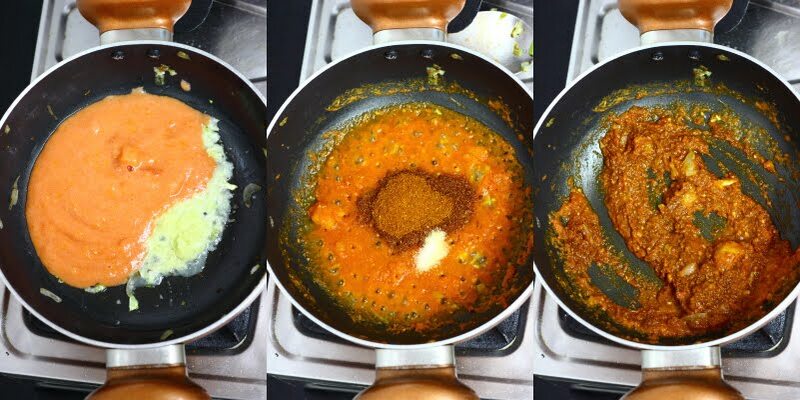 Add the ginger-garlic paste and the tomato puree and cook on low heat for 5-7 mins until the water from the puree evaporates and you get a thick tomato masala. Add the pav bhaji masala and salt and mix well. Add the fried vegetables and mix well. Add the rice and mix well. Garnish with finely chopped coriander and serve. Very yummy and easy recipe.Plus since this is not directly made in a pressure cooker, we can adjust the spices,salt according to taste. Absolutely right! I hope you liked it.